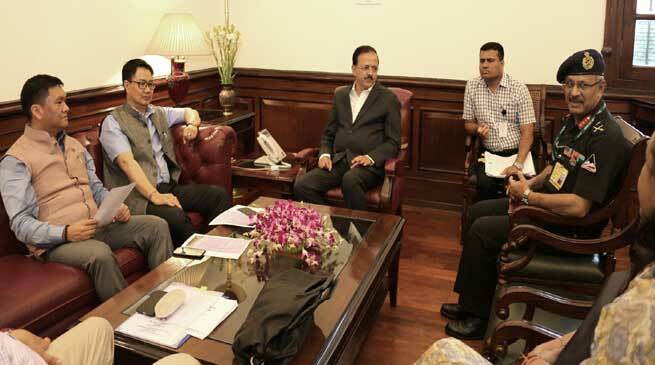 Chief Minister Pema Khandu called on Minister of State for Defence Dr Subhash Bhamre and discussed on compensation and land acquisition issues for defence purposes in the state at South Block here today. Also present in the meeting called for taking decisions and resolve bottlenecks were Minister of State for Home Affairs Kiren Rijiju and top army and Department of Defence (DOD) officials. From the state government the Chief Secretary, Secretary to CM and Resident Commissioner were present. Pending cases of land acquisition at Bora Rupak (Baririjo), Bame (Tirbin), Basar, Baisakhi (North and South of Sela), Seppa, Shanglem (West Kameng), Mechuka, Tuting, Mandala (Dirang), Orak-Nacho-Kojin Nallah (Upper Subansiri), Manigong, Tawang, Anini, Tato, Kalaktang, etc were discussed. Also several finer issues like compensation, forest clearance for building border roads, NOC by the state government and release of compensation by the army were taken up for discussion. The Chief Minister informed that issues of high lease rate, grant of ownership rights, payment of dual compensation and fixation of land rates will be resolved soon. He said the state cabinet has already constituted a high level committee (HLC) under the chairmanship of Minister, Land Management to examine these and assured cooperation. “The HLC will be submitting its report in a month’s time and then the state government will make a final call,” Khandu added. MoS Defence asked the DOD and army officials to fast-track all the pending issues by properly coordinating with each other and the state government. He expressed happiness that both the Chief Minister and Chief Secretary were present in the meeting, which he viewed as overdue. “As the chief minister and the chief secretary are here we believe all issues on part of the state government will be cleared and land required for defence purposes in the state would be acquired but by paying land compensation to the rightful owners on time,” Dr Bhamre said. He also stressed that such tri-partite meeting between the army, DOD and the state government should be held in regular intervals to resolve pending issues. He went on to suggest a similar meeting in a few months time in Arunachal Pradesh to reassess the actions taken after this meeting. Rijiju, on the other hand, called for resolving all issues and clear pending cases in a time bound manner. He sought from the officials the time they will take in clearing all the issues that came up for discussion during the meeting. “It should not be ‘it will be done’. It should be ‘it will be done within this month or two month’s time’,” he said and added that he will come asking once the time set is over. Rijiju also requested MoS Defence to follow up with his officers and the Chief Minister to follow up with his officers simultaneously so that there’s a constant pressure on all to finalise all pending cases.